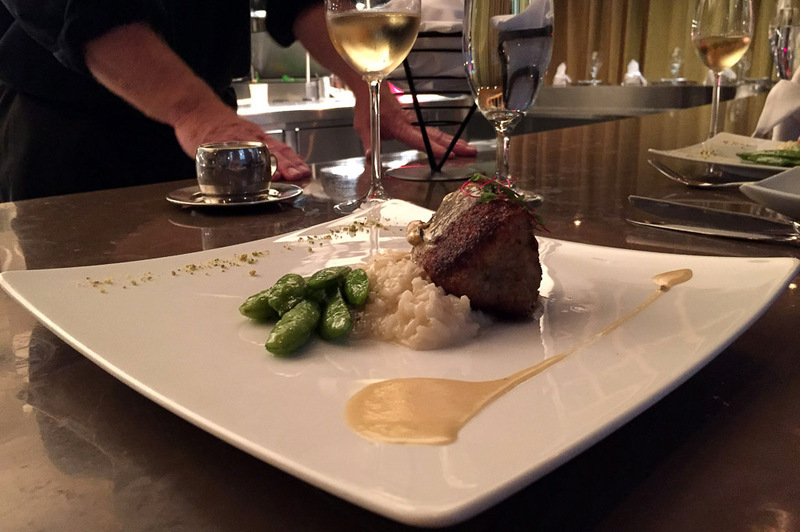 Artisans Restaurant is located in Midtown on the corner of Louisiana and Stuart St. I had heard so many great things about this restaurant that I couldn’t wait to experience it for myself. 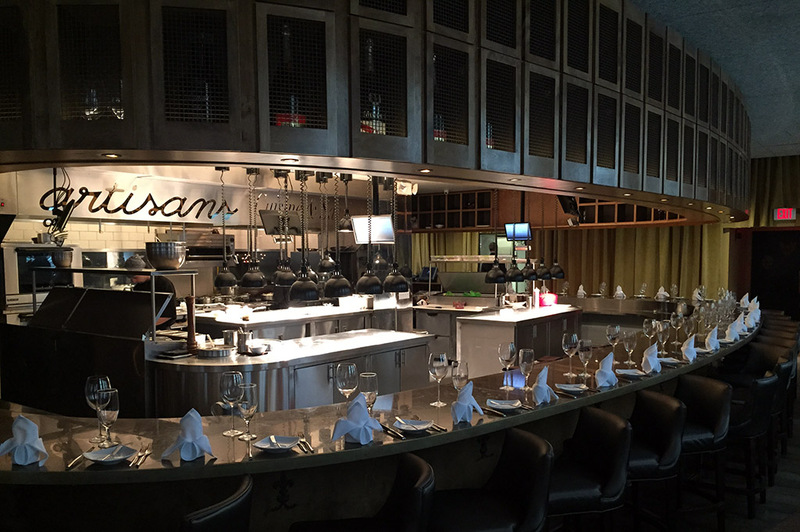 Chef Fox delivers the Chef’s Table concept to his restaurant and that is music to my ears. I believe everything tastes better when you enjoy it straight from the kitchen. The layout of this restaurant is exactly what I love to see. 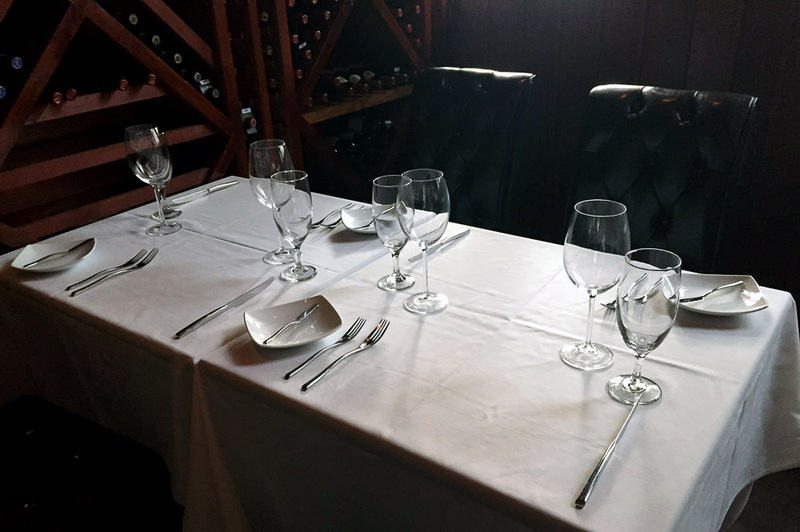 There are many different areas to enjoy your experience any way you see fit: a private room, a banquet room, tables, booths, bar and my favorite… the Chef’s Kitchen! In most places, this is usually a table in the back of the kitchen, but at Artisans it is a half-moon that wraps around the kitchen. Awesome! So, we sat right in the middle of the action because, in my view, a true culinary experience starts in the kitchen and then translates to your plate. The truly knowledgeable staff guided us through from start to finish. I enjoyed the interaction and explanations we received. Of course, we let the Chef know we would like the Chef’s choice. 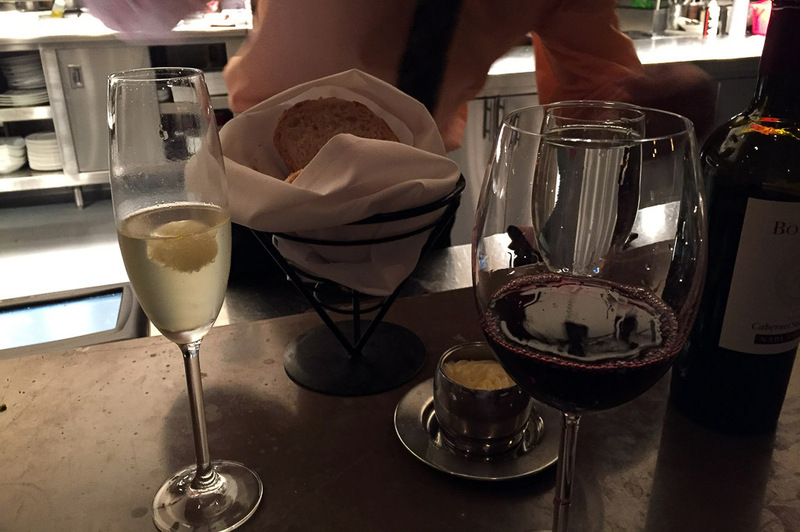 We always do this at fine dining establishments because it’s a great way to explore new taste combinations and dishes you might not otherwise choose. I discovered right away that the decision of leaving our selection up to Chef Fox was a smart one. We started the night off with a couple of specialty cocktails. 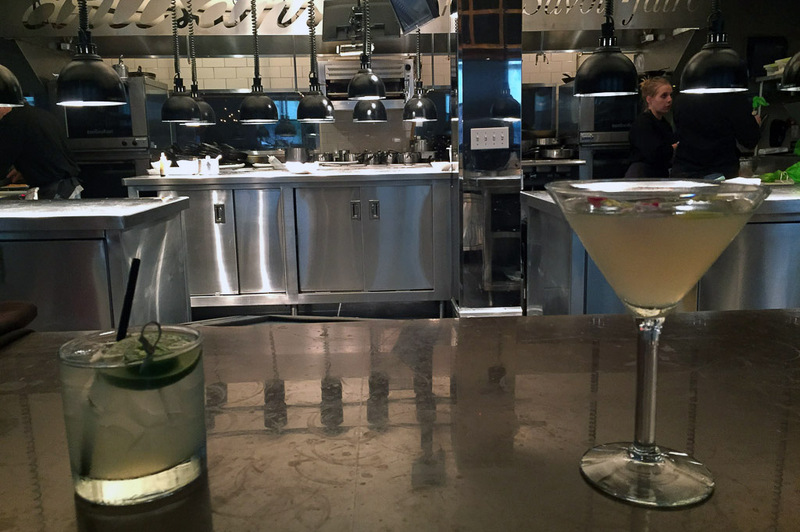 We ordered the Park Avenue Martini – I am always in favor of a Gin martini – and this delicious pineapple-flavored Perfect Martini (Gin) was a great choice. 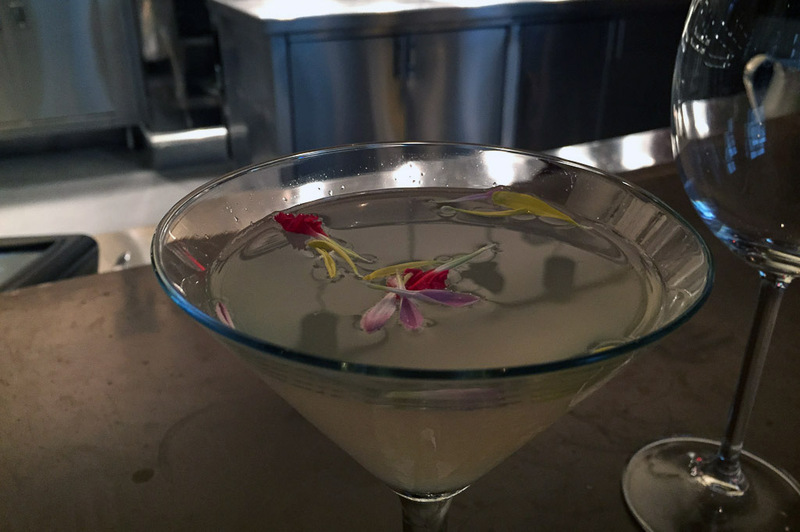 It is an excellent drink to shake up a Martini routine and is nice on hot summer days or for a refreshing aperitif. We also ordered a Spicy Moscow Mule made with vodka, a splash of spicy ginger beer, and lime juice with a fresh slice of jalapeno. The bit of spice from the jalapeno was just the right touch. I loved them both. Our first plate of hors d’oeuvres was delivered and received with big smiles. 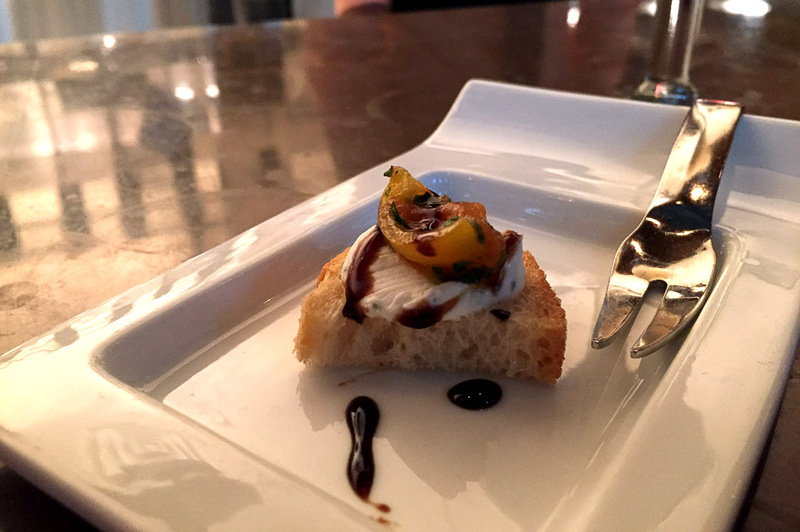 What a wonderful start: a crostini with graddost cheese, marinated tomato and balsamic reduction. Simply a bite of heaven! 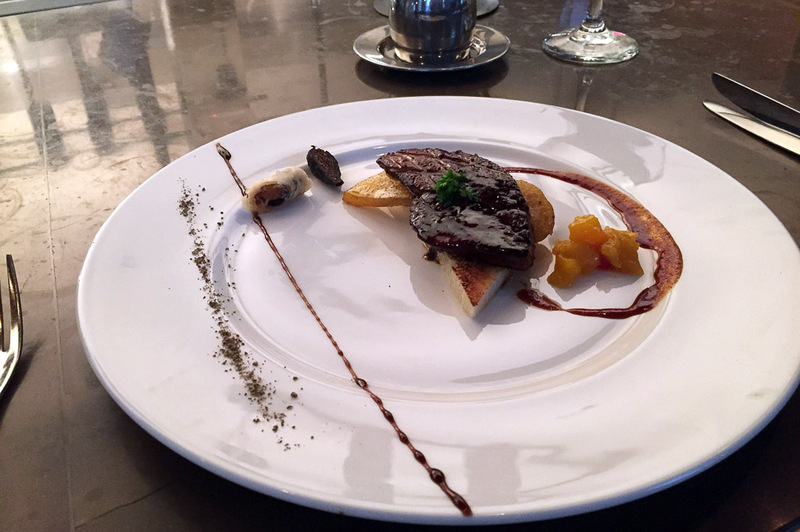 Next up was Le Foie Gras: pan-seared Foie Gras, Crème de Cassis Demi-Glace, Saffron Poached Pear, and Baklava. I am not a huge fan of Foie Gras, but like anything else, when done right it is wonderful. I can honestly say that the Foie Gras at Artisans is the best I have ever tasted. It was paired with a glass of Jurançon ‘Ballet d’Octobre’, Domaine Cauhapé 2012. 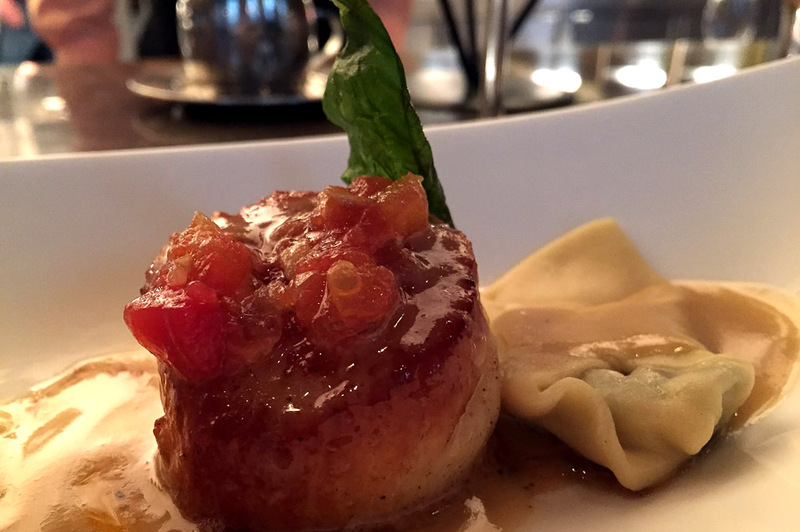 Now for Les Noix de Saint-Jacques… pan-seared scallops, spinach ravioli, and beurre blanc served with lobster cappuccino and paired Paul Bouchard & Cie Chablis 2012, a Chablis produced in the northernmost wine growing region of Burgundy. Wow! Every flavor here works together to complete this masterpiece. 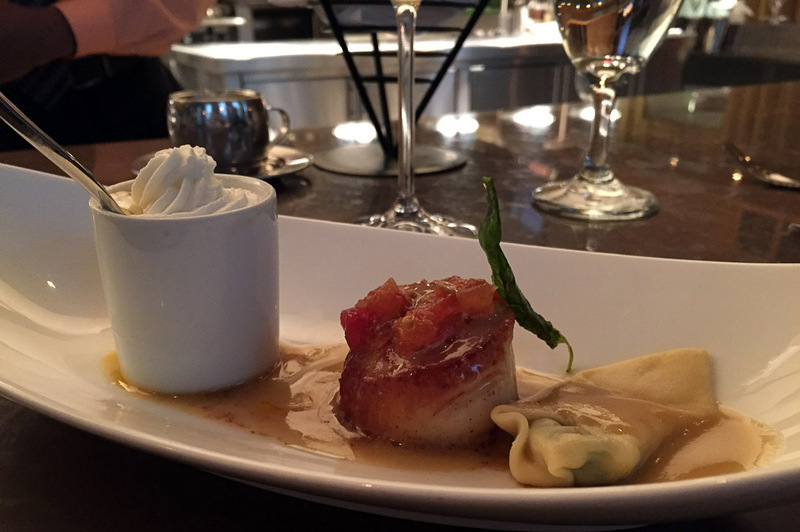 The seared scallops were perfectly cooked and the lobster cappuccino was amazing. 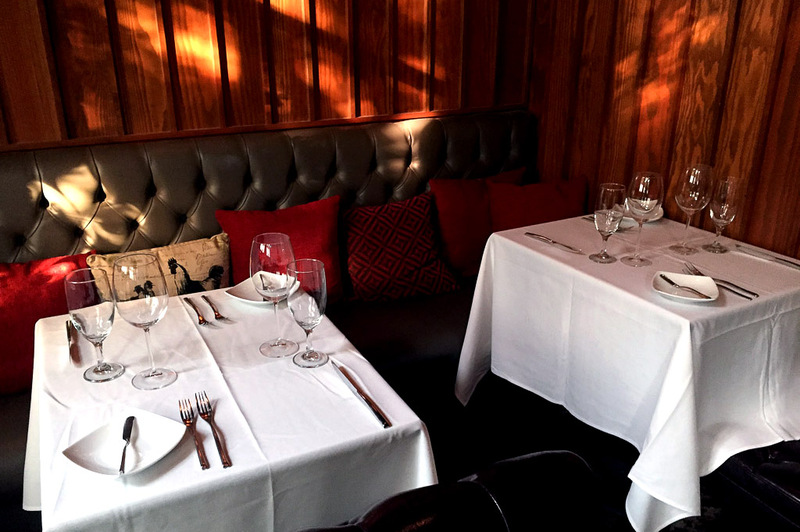 Make sure to ask for it when you dine here, it is a must-try for sure! And then the plot thickened! The finale was on its way and, if the evening hadn’t already lived up to my expectations… well, here we go. We had two delectable entrees: one fish and one beef. 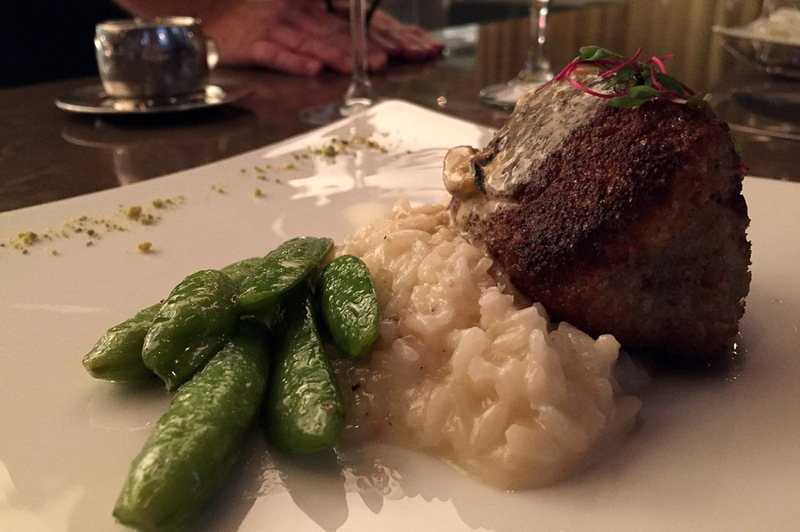 Le Poisson du Pacifique consisted of a Chilean sea bass enclosed in a pistachio crust topped with Mussels Velouté, and served with creamy risotto and sugar snap peas. Chilean sea bass is quickly becoming one of my favorite seafood dishes. The pistachio crust is an enjoyable touch; it makes for a great shell that, when broken through, delivering an amazing crunch and texture. This dish was so delightful that I feel at a loss for words. It was paired with 2012 Starry Night Russian River Chardonnay. So much for the surf – now for the turf! 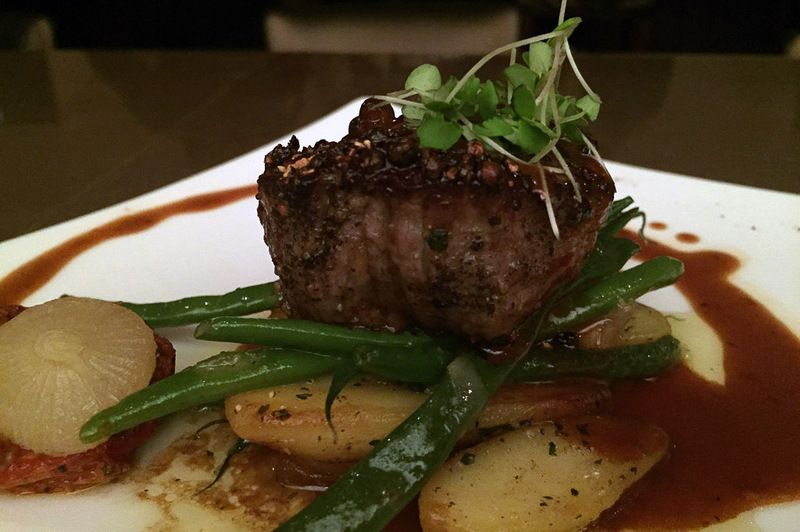 Le Filet de Boeuf au Poivre was comprised of black pepper-crusted beef tenderloin with green peppercorn sauce, fingerling potatoes rôties, and haricots verts (green beans). The filet was everything I expected and then some. 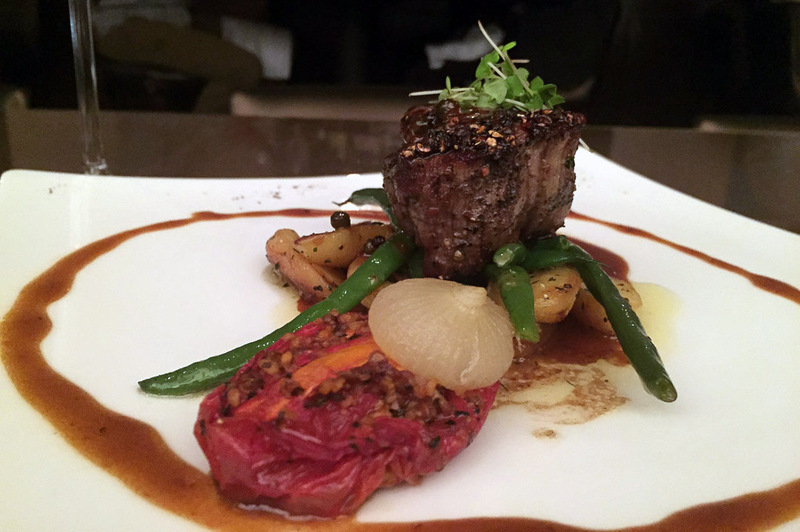 The filet was perfectly cooked and the green peppercorn sauce gave it a nice accent which brought all the flavors together. 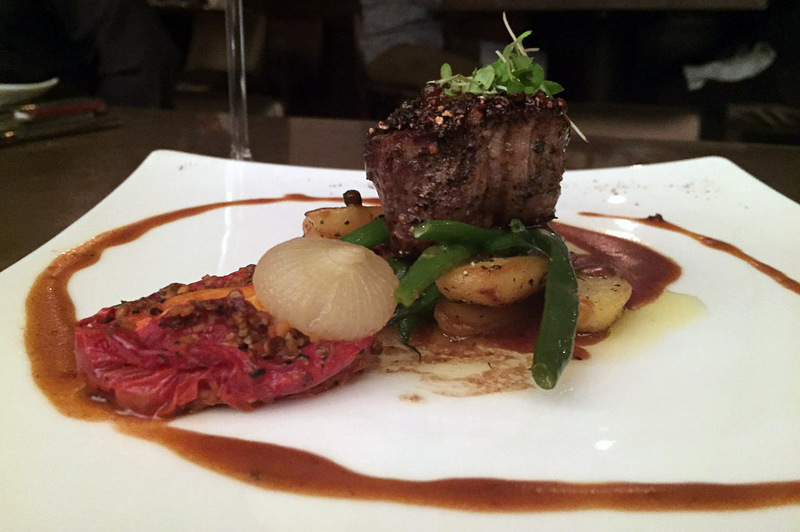 This unbelievable dish was nicely paired with one of my favorite wines of the night; ZD Cabernet Sauvignon. The combination of fruit, oak and tannin integrate seamlessly to provide a long, powerful finish. Now, at this point, I thought I couldn’t be any more impressed with the night here at Artisans. The experience had exceeded my high expectations, to say the least. But, wait… there is more. Ha! I found out that we had two desserts to share and they were on their way. First was the Tarte des Soeurs Tatin: Apple Tart Tatin with butter-caramelized apples served with vanilla-bean ice cream – simply an exceptional way to wrap up a beautiful meal. The butter-caramelized apple worked hand-in-hand with the vanilla-bean ice cream to produce a delighted expression on my face that has yet to be removed. Seriously! 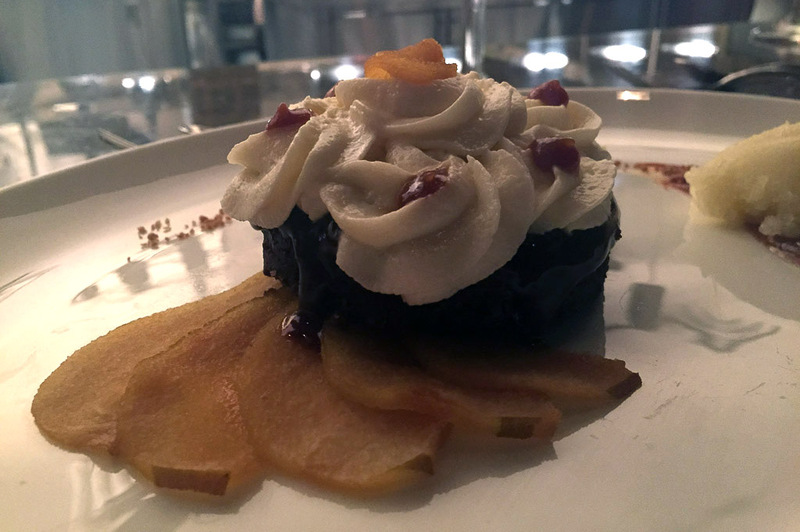 And if that wasn’t perfect enough, the second dessert was Biscuit Brownies au Chocolat Ganache Caramel Poire Pochée: brownies drizzled in ganache topped with a caramel-poached pear and served with pear sorbet. Who doesn’t love chocolate? 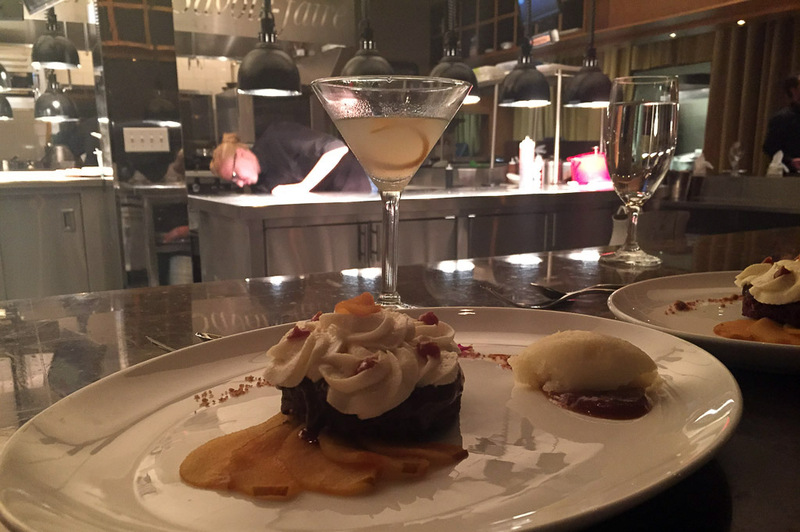 The delicious flavor of chocolate along with that of the caramel, pear and sorbet made for a symphony of sweetness. It was paired nicely with a Croft Distinction Special Reserve Port – a rich premium reserve of superior age and quality. A combination that was out-of-this-world! I take one more glance at the specialty cocktail list. I cannot eat another bite, but I am enjoying my night here so much, I just don’t want to leave. At this point, we are enjoying conversations with others at the Chef’s Table and with some of the kitchen crew. 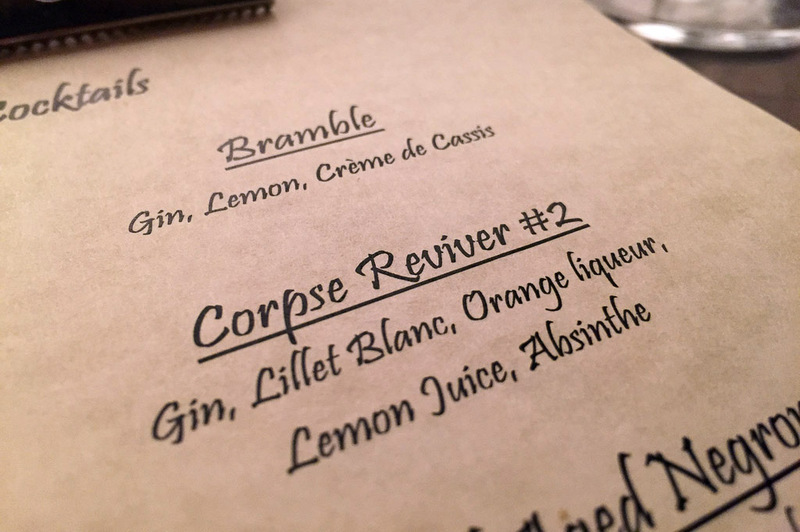 So, I decide to order a Corpse Reviver: a mix of Gin, Lillet, Cointreau and Absinthe. If you’ve never tasted this… you must. I am a fan of Ernest Hemingway and, legend has it, this historic cocktail which dates back to the 1800’s was one of his favorites. Let’s just say it bluntly. Thank you UBER… ha! The Artisans experience is something everyone should be allowed to enjoy. 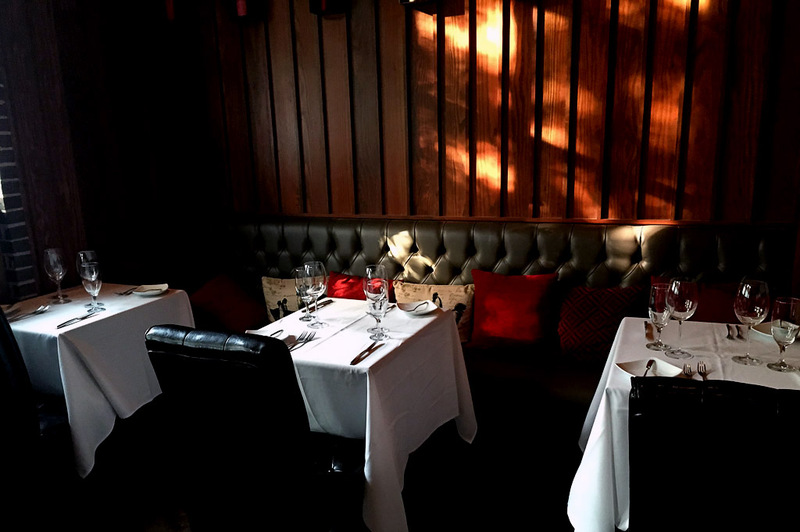 It is the perfect place for any occasion. 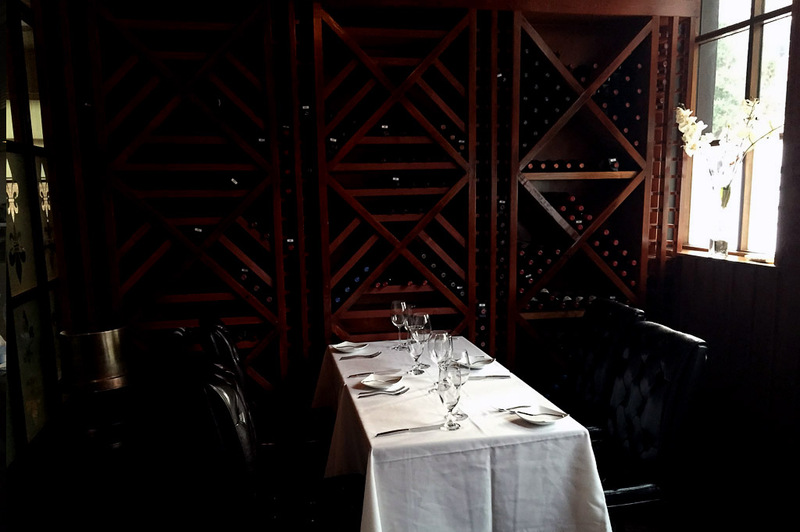 Not only is Artisans a beautiful restaurant in every facet, but the level of attention to detail here stands up to any restaurant in the country. When you dine at Artisans, you are not only receiving a first-class meal, but also a culinary experience you will remember for a life time. It’s the type of place you leave feeling like you just met a new friend. I highly recommend you stop by and enjoy yourself at Artisans, you can thank me later!